Just as with a Ripasso wine, re-passing Valpolicella over the skins of Amarone grapes too delicious to discard, Madott's literary revisitation of the original Making Olives, amplified with five new "secrets" has created a second and a mature fermentation. 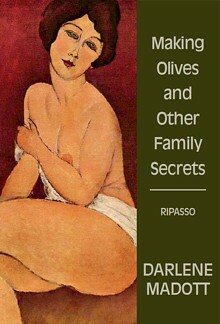 The original Making Olives and Other Family Secrets was a young woman′s collection. I needed to revisit the young woman I was, because I missed her. But I couldn′t stop there. I had to continue her journey. Sometimes the only way forward is the way back. With "Entering Sicily," I visit the landscape of my maternal grandmother′s birth place of Vita. How womanly that landscape of Sicily is – the slopes of hills as sensuous as the breasts of reclining women. 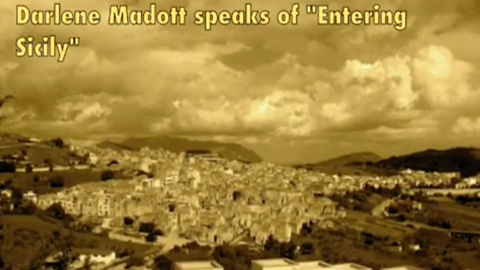 You can "Enter Sicily," but there is no penetrating the masculine Calabria. Hence, the story "Touching Calabria: a Short Story in Little Time." These are remarkable companion pieces. They are the mother and father within. The power of "Touching Calabria" comes from the secret of my father′s last unfinished painting. He was painting his mother′s town of Jesuite from the vantage of his father′s San Vincenzo, from a photograph I had taken, painting this at about the time of his fall. The fear I felt in "Touching Calabria," lost in the mountains my father had never seen for himself, afraid of not making my way back, finds its counterpoint in the fearlessness of the father, facing his death alone, without illusions or opiates. I never could have written nor understood the last five stories of Ripasso. It has taken all of my journey, which I give to you, now, my reader – offering up the pain along with the joy. In passing over again some of the old grape skins, I have deepened the colour and released the power and the passion. I invite you to enter and to touch with me.